The paper reviews the advantages of the synthesis of porous three-dimensional (3D) graphene obtained by various exfoliation methods, with a focus on their recent progress and remaining challenges. The manufacturing procedure influences some crucial properties of obtained carbon materials, such as pore structure and the chemical composition of the surface. 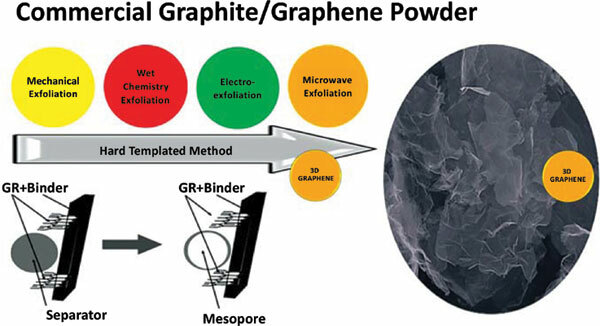 Objective: Proposing a new 3D functionalization of graphene obtained from commercial graphite by liquid phase exfoliation in several simply synthesis stages by means of hard template method. Strategy: Porous 3D graphene is a promising candidate for graphene-based electrode materials owing to its high surface area, high conductivity and pore distribution. Review: In this review, we focus on the latest advances in graphene exfoliation with particular attention focused on non-oxidative wet chemistry exfoliation. Exfoliation methods are evaluated regarding 3D structuring of exfoliated graphene flake into a porous matrix of the extended surface. Keywords: 3D structuring, exfoliation, extended surface, grapheme, hard template method, porosity. Keywords:3D structuring, exfoliation, extended surface, grapheme, hard template method, porosity. Abstract:The paper reviews the advantages of the synthesis of porous three-dimensional (3D) graphene obtained by various exfoliation methods, with a focus on their recent progress and remaining challenges. The manufacturing procedure influences some crucial properties of obtained carbon materials, such as pore structure and the chemical composition of the surface.